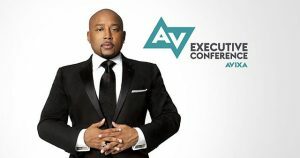 AVIXA, the Audiovisual and Integrated Experience Association, has announced that Daymond John, star of ABC’s Shark Tank, will headline the fifth annual AV Executive Conference (AVEC), Nov. 8-10, 2017, at the Ritz-Carlton Key Biscayne, Miami. This year’s AVEC theme, ‘Differentiate, Accelerate, Disrupt’ will focus attention on key differentiators that elevate a brand above the rest, the steps to building a high-performing team, and how to disrupt the status quo. Focused on the management side of running an audiovisual business and completely re-imagined for 2017, the event will host industry leaders for three days of strategic business planning, industry insight sharing, and networking. To demonstrate exactly how organizations can differentiate, accelerate, and disrupt, speakers with resumes featuring ABC’s Shark Tank, CNBC, Google, BuzzFeed Motion Pictures, the U.S. Navy Blue Angels, and best-selling books, will share their life lessons with attendees. For the first time in the event’s five-year history, the 2017 iteration of AVEC will give attendees an exclusive sneak peek into some of AVIXA’s latest industry research, with a specific focus on how today’s larger macro-economic trends are impacting the ways AV products and services are being bought, used, and maintained. Headlining AVEC keynote speaker Daymond John is the Founder and CEO of global fashion brand FUBU, star of ABC’s Shark Tank, and the Presidential Ambassador for Global Entrepreneurship. Also a New York Times best-selling author, John is the personification of the American Dream, from his humble beginning on the streets of New York, to a self-made multimillionaire with over USD 4 billion in global product sales. During AVEC, he will teach attendees how to apply his successful methods — from innovative marketing techniques to optimizing talent — to their businesses. In addition, Marci Rossell, former Chief Economist for CNBC, will kick off the conference, providing a snapshot of macroeconomic trends. Rossell is an expert in explaining the interconnection of economics, politics, culture, and the media. She will also join a state-of-the-market panel with AVIXA Chief Executive Officer David Labuskes, CTS®, CAE, RCDD, for a microeconomic discussion examining the professional audiovisual market. This will be followed by an executive end-user panel to discuss trends impacting key vertical markets and share insight for the challenges facing the AV industry. Jonathan Perelman, who previously held the roles of Vice President of BuzzFeed Motion Pictures and Global Lead for Industry Relations at Google, will show AVEC attendees how to differentiate their companies by rising above the noise, standing out in crowded industries, and telling brand stories in memorable ways. Also joining the conference is Stephen Shapiro, innovation expert and author of Best Practices Are Stupid, who will reveal his strategies for disruption. For over 20 years, he has presented his provocative strategies on innovation to audiences in 50 countries. According to Shapiro, the more you know about the audiovisual industry, the harder it is for you to think differently. He will share why expertise is the enemy of innovation and what you can do about it. John Foley, former Lead Solo Pilot for the U.S. Navy Blue Angels, will talk about performance acceleration. Foley’s journey to becoming a pilot didn’t come easy; with persistence, hard work, and the will to overcome obstacles and setbacks, he achieved his dream. With an energizing delivery, Foley will share a practical model for achieving your goals. To learn more about AVEC 2017, click here. This entry was posted on Wednesday, September 20th, 2017 at 15:59 @707 and is filed under DailyDOOH Update. You can follow any responses to this entry through the RSS 2.0 feed. You can leave a response, or trackback from your own site.